UNAVCO provided field engineering support for a third consecutive year to gather GPS data at the Biocomplexity study sites maintained near Thule, Greenland by Ron Sletten (University of Washington) and Jeffrey Welker (University of Alaska, Anchorage). The work in this region is aimed at quantifying the coupling of the carbon and water cycles and the interacting physical, chemical, and biological (PCB) processes that control carbon exchange between cold, dry terrestrial ecosystems and the atmosphere. 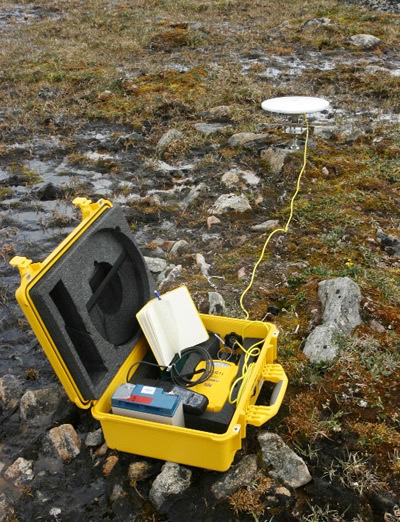 During the 2005 and 2006 Thule campaigns, a network of GPS monuments were installed in terrain at four study sites to measure down slope soil motion known as solifluction. These sites were reoccupied during the 2007 campaign to better understand soil dynamics within features of the arctic tundra and to obtain solifluction velocity vectors. In many instances, movements of several centimeters were shown to have occurred over the duration of the three year study. Four new monuments were installed in areas of particular interest in Green Valley to better capture the features of two lobes in the study. Further mapping operations were also completed, improving on past surveys of the study areas aimed at delineating watershed boundaries and periglacial features. 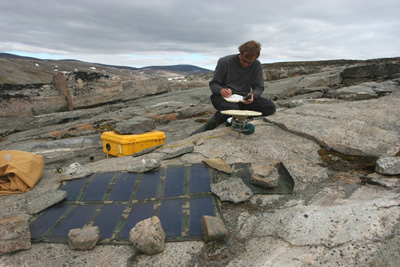 Figure 1 - UNAVCO Engineer Seth White sets up GPS Base Receiver at Green Valley solifluction site, near Thule, Greenland. Figure 2 - Measuring movement of tundra solifluction lobes in Greenland's Green Valley.